There is an increasing need around the country, to connect legal professionals, students and those interested in human rights, with campaigners and advocates working for climate justice. Register with us to get involved and support campaigns to Stop Adani, and for climate and environmental justice. We are often called upon to provide support and legal information for people who are participating in peaceful activism and protest. 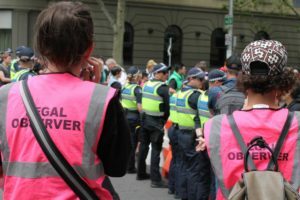 We have provided training to legal and human rights observers, legal education, and written reports into the policing of protest – for environmental and climate justice campaigns across the country. We have a range of resources collated, as well as some that we have written, available here. And we are now hosting a CLIMATE JUSTICE LEGALS NETWORK to support people working for environment and climate justice around the country. We will be working in collaboration with Melbourne Activist Legal Support, as well as burgeoning citizen legal activist groups in Brisbane and the newly formed Activist Legal Network (NSW). We are hoping that this pilot project can grow to become a useful support for activists working for climate justice around the country. There are a wide range of needs and the sky is the limit. At the moment we are focusing on immediate needs on the east coast and our priorities are advice, representation and resources for people working to Stop Adani and working for climate justice – working in grassroots campaigns. We would also like to develop a rapid response list where we may need to source urgent advice and information, and can put a call out to people, and see who is available to respond in a timely manner. Our experience has been that Community Legal services are under-resourced and have more urgent priorities, and Legal Aid is now focused on people who risk imprisonment. So the role historically played by CLC’s has been wound back due to capacity constraints. In addition Environmental Defenders offices do brilliant work, but are more focused on environmental law. So this is a community led initiative as we have found that overstretched community legal services have little time or ability to contribute to activist legal support. We are very happy to collaborate with community legal centres however, so if you have time, even if it’s limited, please hit us up! Examples of recent community led and activist focused legal support projects, are Melbourne Activist Legal Support (MALS) who we work and collaborate with, as well as Justice Tracks – a Sydney based collective that did great work but is now defunct. 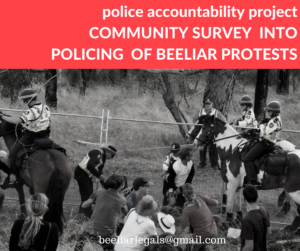 In Perth there was a project that supported the Beeliar campaign that defended wetlands from road construction in early 2017, and supported legal observer teams, and pro bono representation for more than 150 people. There was a subsequent police accountability report written based on collated observations of legal observers that we coordinated. CounterAct, MALS, and independent progressive lawyers have been involved in all these projects.There have also been other projects around the country such as Human Rights Observer teams fielded by Caxton legal centre, and Amnesty International, and various citizen initiatives relating to policing, searches, and sniffer dogs. We are seeking barristers, solicitors, law students and people with experience in various aspects of law. Legal research in a range of areas. Pro bono or low fee representation in regional areas, and capital cities. Legal advice on matters relating to peaceful protest and political activism. Advice and assistance regarding police accountability. Research and assistance in producing plain language resources. For example we have had numerous requests to adapt our legal handbook for climate activists based in Victorian law, for other jurisdictions. KEEN? Register here, and we will be in touch. Or you can donate to support our work here.